While most of us don’t want ads at all, Google has found a way to deliver them faster. AMP’s original goal was to lift up the user experience across as much web content as possible. This meant we couldn’t just build some idealistic system–existing monetization methods would need to be supported in order to get the wide adoption that would lead to widespread user experience improvements. On today’s web that meant: AMP had to support advertising. But it notes it’s not as easy as speeding up ad delivery. There’s a bit of nuance to it, which the company calls a ‘coordination problem.’ Rather than simply delaying ad delivery until the content was seeded on your screen, it wants to load both content and ads at the same time — without slowing anything down. And that’s a tough proposition. To accomplish it, Google has separated the ad request (the ‘auction’ as it were, because ad space is basically bought and sold in real-time) on the server side from the ad rendering. That might sound more complicated, but as you see in the GIF above — unbundling the two processes can lead to near-instant load times. 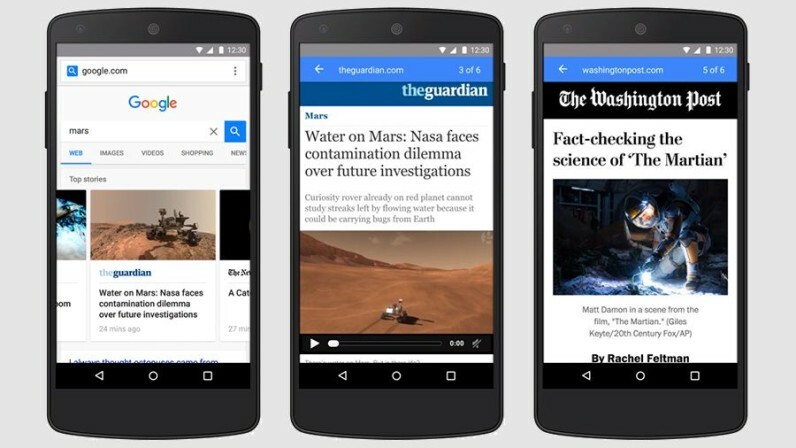 It’s still early days for AMP ads — which Google is calling A4A — but it’s promising. It’s great for advertisers, which get their ads in front of eyes faster, but not so obtuse that users will be offended. A4A can also be used away from AMP pages, so this could be beneficial to the entire Web… and make Google a lot more money in the process, of course.